Creative Director Anne Hahn has diverse experience in consumer magazine and trade book publishing, including research and writing, publications design and development, direct marketing and circulation planning, production and print services, publicity, and curriculum development. She has worked for Cahners Publishing, Yankee Inc. (publishers of Yankee Magazine and the Old Farmer's Almanac, Forum Communications (publishers of Cuisine Magazine), and Interactive Composition Inc., providing full-service book production to Harper Collins, Addison Wesley, Prentice Hall, and McGraw-Hill, and other publishers. She also served as Publications Manager for Bert Rodgers Schools, Sarasota, Florida, a distance learning school offering pre-license and continuing education to real estate, health care, and other licensed professionals. Her primary areas of focus are education and hospitality creative services, including publications development, direct marketing and collateral design, web content development, signage, and merchandising options. Phil Hahn offers years of experience in hardware, software, and communications design, specializing in local and wide area networks, security design, and web and database development. 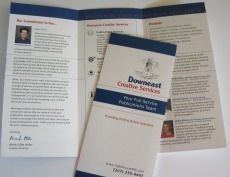 Often clients' print, web, and marketing projects demand technical areas of expertise. We provide a range of services to our clients using the latest technologies in network and security architecture, information and e-commerce systems, and IT project management. Alison Harner brings diverse experience in web design and production, as well as database design and administration, online learning systems, and technical support. Leslie Rowe provides a range of editorial services, including writing articles, marketing content, web sites, reports, and technical manuals. In addition, she brings expertise in web site development, public relations, Internet marketing, and copyediting.